Hamilton's Wintec held its Spark 06-International Festival of Media, Arts and Design this week. There were some pretty political speakers there, like Bruce Connew, Dave Armstrong and Lisa Reihana, but the most notable was Cuban academic Flor de Lis Lopez Hernandez. Ms Hernandez spoke on "how powerful graphic elements can aid social change and play a key part in building a new society"
But she has a lot to propagandise about. Today, Hernandez told the Waikato Times that "far from a country on the brink of economic meltdown and political turmoil, Cuba is a happy, progressive country in search of an alternative to capitalism". Despite growing international speculation over the health of Cuban President Fidel Castro, Ms Lopez Hernandez said Cubans are optimistic about the future. "Fidel has been very smart because he has prepared the people for life without him," she said. Castro's legacy to Cuba was a positive one, she said. "He will be remembered as one of the great people of the 20th century. "He has always fought for a better standard of living for all people. That has been his fight since the beginning," Ms Lopez Hernandez said. 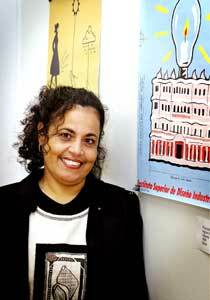 Even without Castro's guidance, Cuba's revolution would continue, Ms Lopez Hernandez said. "It is always in progress, it is never finished. "We are always looking for an alternative that is not capitalism." New Zeal Comrade Fidel would like to thank the NZ taxpayer and Creative New Zealand for allowing Ms Hernandez to spread the revolutionary message the oppressed people of New Zealand. Fidel adds that the sequencing of the capital letters in this post's title are purely sublimi....coincidental.